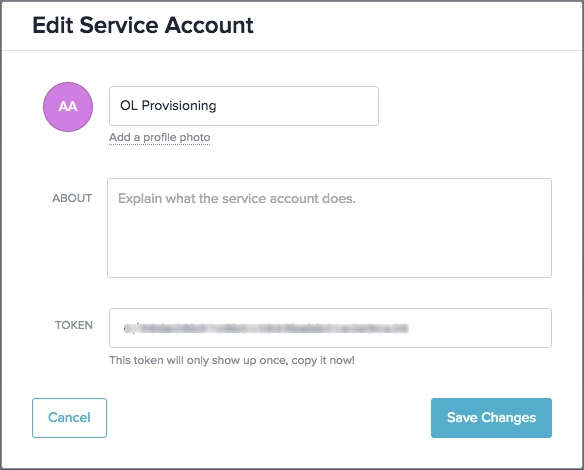 This article describes how to configure OneLogin to provision users with Asana. Note. Asana can change this process at any time. For the most up-to-date instructions, see the Asana documentation at https://asana.com/guide/help/premium/service-accounts. Log into Asana as an administrator. Go to the Service Accounts tab. On the Edit Service Account dialog, name the service account and copy the Token. You will provide this token to OneLogin in the next task. Log into OneLogin as a Super user or Account Owner and go to Apps > Company Apps > Asana. On the Configuration tab, connect to the Asana API. Enter the Asana Service Account Token that you copied from Asana in the previous task. Select Enable provisioning for Asana. Select how users that are deleted in OneLogin are handled in Asana. On the Parameters tab, confirm the mapping of Asana attributes to OneLogin attributes. NameID (Subject) is included in the SAML assertion passed by OneLogin to Asana. For both parameters, you should keep the default OneLogin value of Email. To confirm that provisioning from OneLogin to Asana is working, assign Asana to a OneLogin user and go to Users > Provisioning to approve the provisioning event, if necessary. When the user is marked as Provisioned, go to Asana and confirm that the new user has been added.